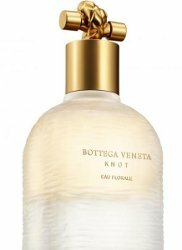 Bottega Veneta will launch Knot Eau Florale, a new fragrance for women. Knot Eau Florale is a flanker to 2014's Bottega Veneta Knot. Bottega Veneta Creative Director Tomas Maier’s inspiration for Knot is a vision of an escape from reality that leads to a villa on the Italian Riviera. The house sits in the hills overlooking the sparkling sea, its interior illuminated by sunlight, its open windows ushering in the saltwater breeze and the scent of peonies from the garden combined with the redolence of clementine trees in the distance. Knot Eau Florale conjures the next chapter of the Mediterranean interlude, this time set in the villa’s flower garden. Blossoming with fragrant roses and peonies, the garden is a private sanctuary that feels intensely alive, yet refined in its expression. A walk among the sun dappled garden paths, savoring the light, the air, and the verdant landscape – the moment may be fleeting but the memories it creates are eternal. Knot Eau Florale was developed by perfumer Daniela Andrier. The fragrance reportedly amplifies the rose and peony from the original Knot; additional notes include mandarin, neroli, lavender, cedar and tonka bean. Bottega Veneta Knot Eau Florale will debut in September; I will update with sizes and concentration when I can. Update: Knot Eau Florale is sold in 30, 50 and 75 ml Eau de Parfum. Ok – I am very excited to try this one. Maybe it will be the Knot for me!